One of the biggest benefits of the Precision Xtra Blood Glucose Meter is the versatility that if offers those with diabetes. It is one of a select few meters that give you the ability to test both your blood sugar level and your blood ketone levels. This type of meter is extremely helpful especially for parents who have younger children with type 1 diabetes. Let’s take a look more in detail on the pros and cons of the Precision Xtra and what I really think about it overall. Testing Blood Ketones: This is the one meter we always keep close to test for blood ketones. This comes in handy when the kids are sick or experiencing a high blood sugar in the middle of the night. It can be rather difficult to get a kiddo with a high blood sugar to get up and want to go test ketones by urinating on the ketodiastix. Instead you can easily test their ketones with one poke while testing their blood sugar levels. While urine strips still work great for the mornings or other times you experience high blood sugar levels, if you want to get a more accurate picture on if ketones are present, the blood ketones are the way to go. Can Diabetes Bankrupt a Country? What Are The Best Ways To Lower Your Blood Sugar Levels? If you are not familiar with using a blood ketone meter, you may be confused when you first see your results, as they are different than blood sugar readings. This is considered to be a normal range for blood ketone levels. I’ve found however, that when they hit 0.3 this is when you should pay close attention to ketones developing. When you see numbers in this range, ketones are currently present. This is when you should make sure you are properly treating for ketones so that they do not develop into a problem later on. Contacting a member of your diabetes care team is important when you are in this range. Readings in this range should be taken seriously as they put you at a much higher risk of developing DKA (Diabetic Ketoacidosis). You should contact your doctor almost immediately to find out what the best treatment option is. If you notice levels above 3.0, a trip to the emergency room might be your best choice to get treated immediately. Easy to Use: The meter is easy to use, all you have to do is put in the right strip (ketone strips are purple, blood sugar is blue) and wait for the strip icon to come on the screen. Fast Results: The ketone readings will be ready within 10 seconds. If you are using the meter for blood sugar readings, they are done within 5 seconds. Smaller Samples: For blood sugar readings a much smaller amount of blood is needed. However, if you are using the meter to test for ketones, don’t be alarmed that a larger amount of blood is necessary. Test Strips: The test strips for the blood ketones tend to be a little pricey and usually are not covered by insurance providers. In fact, they come in boxes of only 10 strips and range in price from $55-$75. The strips are in individual packages, which means you must open a strip package each time you need to test. This can get time consuming especially if you are in a hurry. Overall, I absolutely love the Precision Xtra meter for ketone testing. I haven’t really used it for blood glucose testing but a few times and it hasn’t impressed me enough on that feature to want to switch. Like the ketone strips, the blood sugar strips are individually wrapped as well, and this feature is one of my biggest hang-ups in the ketone meter. The ability to test ketones when my kids are sleeping is wonderful. I don’t have to force them awake to try to go to the bathroom in the middle of the night. When they are sick is when we really use the meter. We can easily go through 10+ tests in ketones only on sick days. The downside of this is, the strips are kind of expensive to replace. While the blood sugar testing doesn’t take as much of a blood sample, the ketone meter tends to take a bit more than many people are used to when testing their blood sugar. I would highly recommend this meter for both parents of kids with diabetes and those who have diabetes themselves. 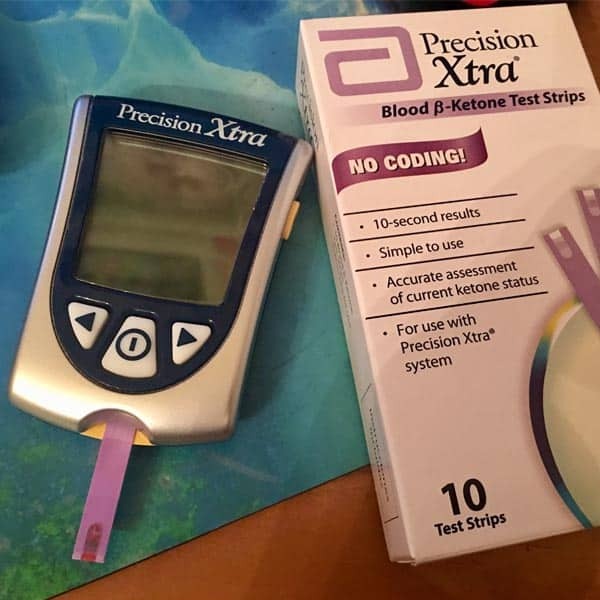 I’ve used another ketone blood meter in the past, and I have to say that I wasn’t as impressed with the results as I am with the Precision xtra. It’s been in our arsenal of Type 1 diabetes tools for almost 5 years now. You can order yours on Amazon. Managing Type 2 Diabetes with Trulicity: What’s the Verdict? Does Consuming Red Meat Increase Your Type 2 Diabetes Risk? Quality of Life: Privileges, Benefits, Rights? I needed to know what the reading on the meter E-2 means. This was a good review for a meter that is affordable for some, but not retired on fixed income! $55. Up for 10 strips! Ouch!!! You can find them on Amazon for $2-3 each in a 10 pack. I have been using the same Precision Extra since 2009. I can’t even read my glucometer ID number. Are you able to send me a new glucometer with computer cable so I can download my readings and have my MD review the results.